* KERNEL_RAM_VADDR >= PAGE_OFFSET + 0x4000. * 这里我们再映射一些RAM来作为 .data and .bss 空间. * as it has already been validated by the primary processor. movs r10, r5 @ invalid processor? * Use the page tables supplied from __cpu_up. teq r3, #0x000f0000 @ CPU ID supported? teq r3, r4 @ ARM 11MPCore? teq r0, #0x80000000 @ not part of a uniprocessor system? THUMB( mov r6, r6, ror #16 ) @ Convert word order for big-endian. THUMB( mov r6, r6, lsr #16 ) @ to be robust against misaligned r3. tst r2, #0x3 @ 是否4Byte对齐? ldr r6, =OF_DT_MAGIC @ is it a DTB? * 参见 <asm/procinfo.h> 中关于 __proc_info 结构体的信息. 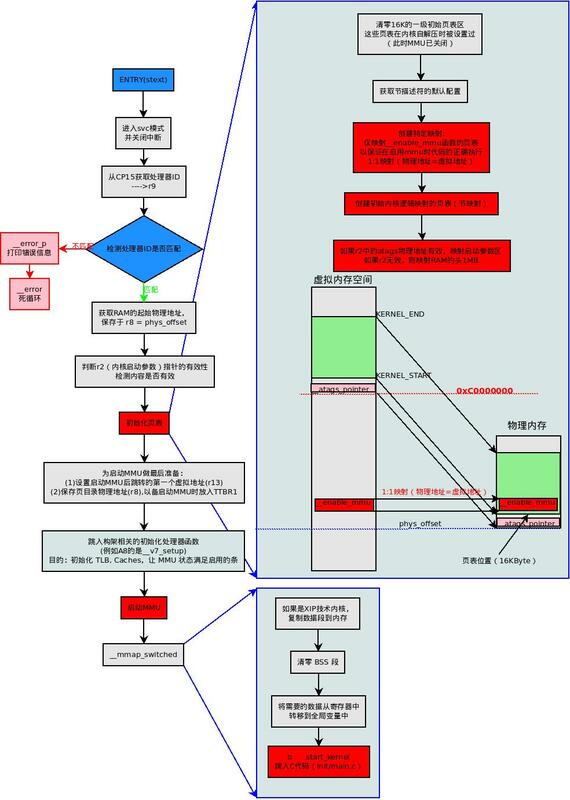 str_p1: .asciz "\nError: unrecognized/unsupported processor variant (0x"
* 出错时屏幕变红 - RiscPC only.